The background is so nice and pretty. Very soft looking and the colours are pretty. Cool looking character too ^__^ . great bg , great colors and lovely scan! Just love the scan and you did a wonderful job on the background. Wow something extraordiary and beautiful at the same time...lovely how the whole bg and effects blends wel...Love the scan and the sakura petals and the text fits well with the whole theme of the wallll! Dont be depressed so much because without pain theres no gain but it really turned out well enough to be a fav from me! Ahh, you beat me to it, I wanted to wall that scan...No hard feelings because this wallpaper is beautiful. I love how you used the scan to make her blow on the petals...very soft and beautiful. The only thing I kinda don't like is the weird fence in the backround. Still, this is going on my desktop. Nice wall I like the background effects and it's not too bright too. Nice job keep it up, Fav. nice! I love the ice even though its kinda a bad thing, you being depressed and all. The scan looks really great here and I love the background!!! The fence needs a little more work though, but I like the moon ^_~ Great job!!! Quote by oracle angelWow something extraordiary and beautiful at the same time...lovely how the whole bg and effects blends wel...Love the scan and the sakura petals and the text fits well with the whole theme of the wallll! Dont be depressed so much because without pain theres no gain but it really turned out well enough to be a fav from me! same here!!! nice concept!! i like it! +fav! This is a great wallpaper. I like the background; the whole ice thing is a nice concept, and the scan fits with it perfectly. I love the winter feel it gives off. Very nice. Great work. Wow!! Great wall, I love the blue and ice themed bg. Gives a feeling of cold winter^^ Great job and keep up the good work!! Your work is always great! really touching wp. This Hazuki scan is also nice. thanks! 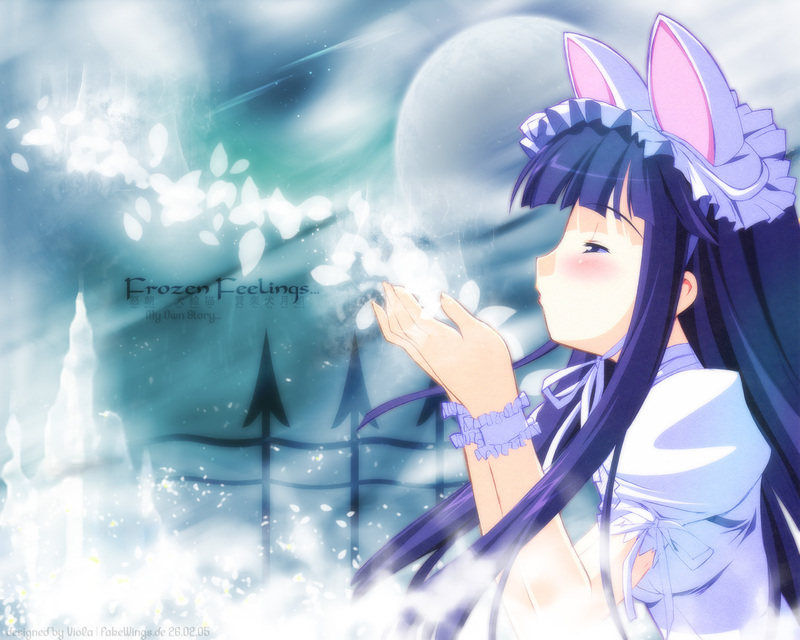 so nice dreamy wallpaper ^_^ i really like the background, it's wonderful and magical :D ! moon and that white mist looks really great. girl is very cute, she has lovely cat ears. i like the way she blow those flower leaves, it's nice detail ! colours of your wall are dreamy and wonderful and other effects are pretty too :) magnificent job ! me gusta mucho ver este tipo de fotos, los fondos son geniales y no hay que decir de las chicas, Yokkata!!!!! !